1. A place near Ephrath, i.e., Bethlehem. 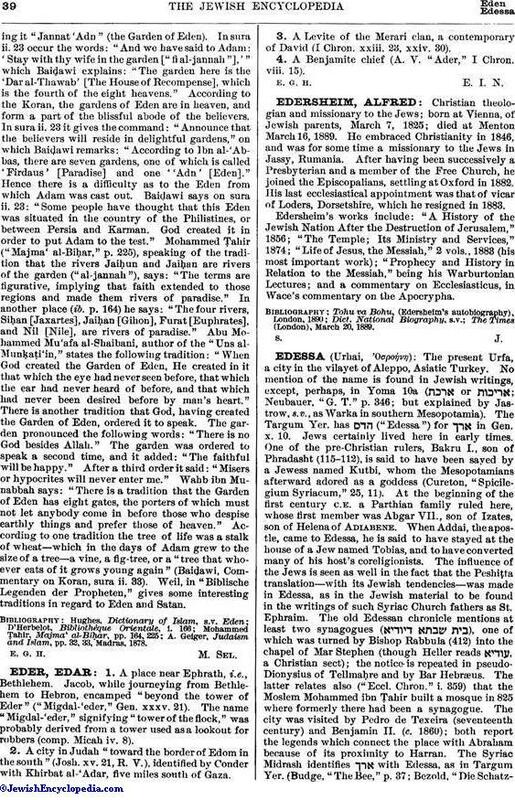 Jacob, while journeying from Bethlehem to Hebron, encamped "beyond the tower of Eder" ("Migdal-'eder," Gen. xxxv. 21). The name "Migdal-'eder," signifying "tower of the flock," was probably derived from a tower used as a lookout for robbers (comp. Micah iv. 8). 2. A city in Judah "toward the border of Edom in the south" (Josh. xv. 21, R. V.), identified by Conder with Khirbat al-'Adar, five miles south of Gaza. 3. A Levite of the Merari clan, a contemporary of David (I Chron. xxiii. 23, xxiv. 30). 4. A Benjamite chief (A. V. "Ader," I Chron. viii. 15).